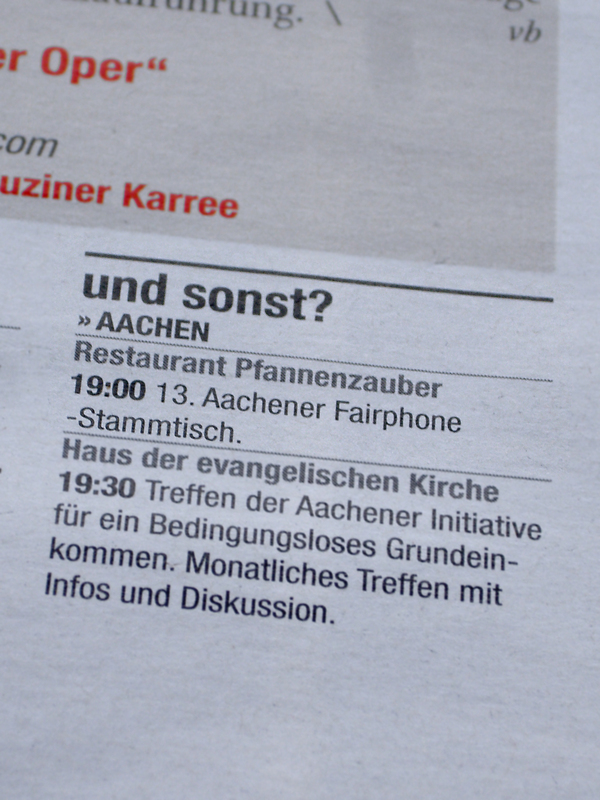 “Nachrichtensperre”, hehe Der Zauberer ist bestimmt zu engagieren, sein übliches Salär kenne ich aber ebenso wenig wie die Antwort auf die Frage, ob auch Teleportieren nach Wien zu seinem Repertoire gehört. Los geht’s im frisch renovierten Pfannenzauber mitsamt neuen Wandmalereien! Update 11:51 pm: Sorry folks, for the first time the Aachen host is too exhausted to write up a full report on the same night. Will write more tomorrow. The curious ones can find the numbers in the very first post. … was quite a demanding 3 1/2 hour night – both for myself as well as for Fairphone Angels from Düsseldorf and Liège who pretty much saved my, err…, very own bottom module, albeit to everyone’s biggest dismay not another longstanding and most loyal first hour Fairphoner’s all new FP2’s core module which remained stubbornly un-revivable. Turnout well exceeded expectations with 18 people (12+2 having FP2s, 3+1 having FP1s, 5 without a FP) in attendance plus three short-time visitors who nevertheless had FP issues to deal with. One was actually offering her fully functional FP1 for free … because “there are no more batteries to buy!” So you can guess – we didn’t accept that! (And directed her to the well-known Generic battery topic, of course.) 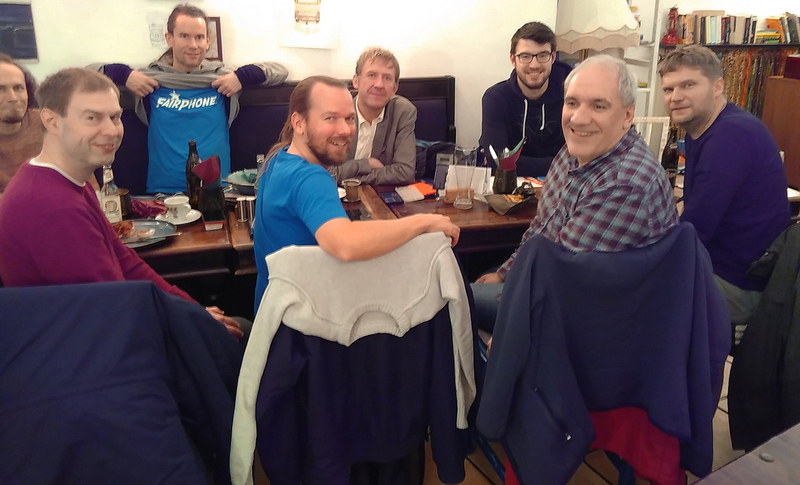 The FP1 was in fact a recurring topic during and even already before the meetup – two locals who could not make it that night had actually been put in touch beforehand in order to let another fully working FP1 change hands from a now FP2 owner to a smartphone virgin. And a returning participant from the 10th meetup was spontaneously equipped with another surplus FP1, having seen her own iPhone 5 take a dive just the day before. A brief introduction around the table revealed that the newspaper announcements paid off big time: Most of the unprecedented attendance resulted from these, but to a smaller part also from having looked us up online (and to teach myself a lesson, the events web page was explicitly mentioned, too). 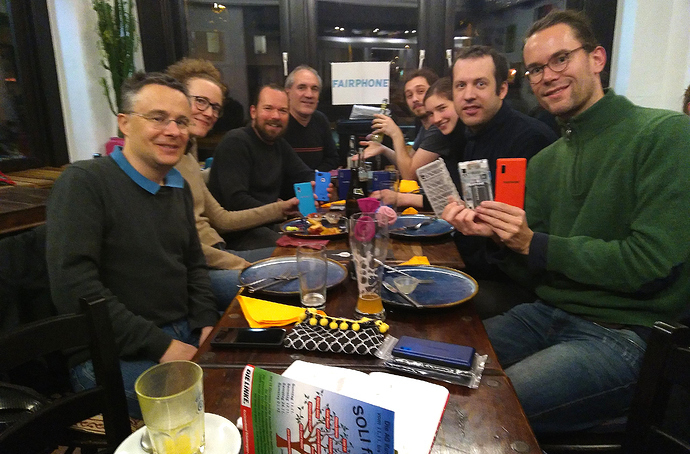 Almost every second attendee joined us for the first time, so a brief introduction to the Fairphone project and its two main drivers – conflict minerals/fair trade and sustainability/repairability – was a must. Most of the planned agenda (Android 7, alternative OSes, Crowdloaning) had to be pushed aside given the abundance not just of questons, but to not mince words: a heavy and partly worrying load of FP2 troubleshooting as well. This host was confronted with quite a challenge and would not have coped with it had it not been for “Angels in Action”: @amber and @oli.sax who provided tireless assistance and support as well as Aachen Fairphoner Christian who had volunteered early to let me demonstrate the dis/reassembly of his FP2 to the eyes of the newbies. I owe you folks a big measure of gratitude, not just for making the way to Aachen, but to also show up and help despite not everyone of you being perfectly well last night. You took quite a load off my shoulders. And although we were able to solve quite a couple of issues (one FP2 owner just needed a little encouragement to re-establish contact between her camera module and the core module by her own hands, another was helped switching from Ubuntu to Lineage), we also had a major disappointment when no one was able to fix a founding Aachen Fairphoner’s all-new FP2 respectively its core module. It will now travel back to Fairphone Support. So all in all a mixed bag – great attendance with many new faces, yet on the other hand also a couple of issues that might not have given the best (but perhaps also not the most representative) impression to some newbies. Nevertheless, virtually everyone was happy to be included in our email list and seemed to look forward to future opportunities to meet up and get in touch. We are eyeing the second half of November for Meetup #12. Wow, congratulations to this bis success! Who is this guy in the back with the white t-shirt? He shows up in different locations. He seems to be everywhere. 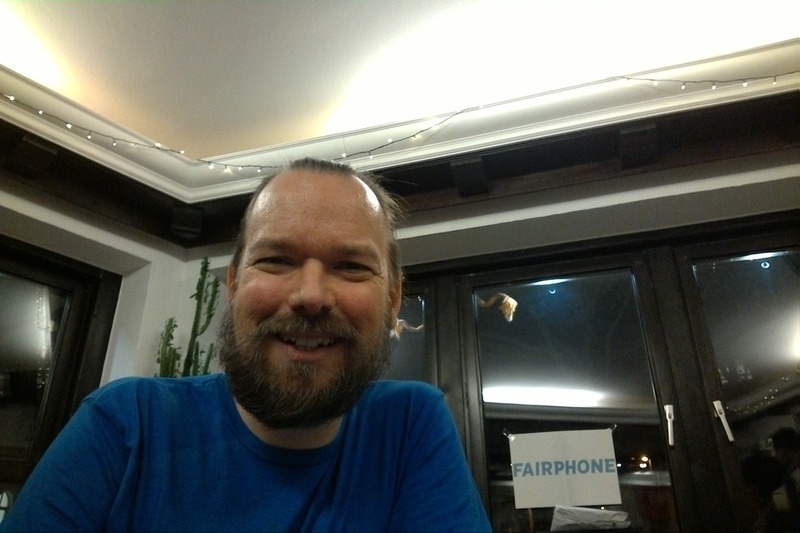 Even at Fairphone’s HQ… #creepy In serious: I’m amazed by this enthusiasm. We should make a forum badge for being at [3/5/10] different meetups. It makes me really happy to see this picture and read about your meet up! 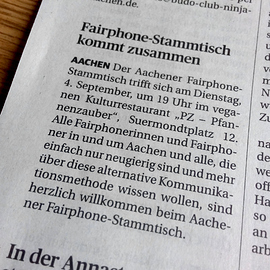 Thanks for sharing and let’s keep on pushing Fair electronics far and wide! A few late (but fully understandable) cancellations had the host a bit concerned prior to the meetup, but the (near) all-Fairphoner composition and the cozy size of the group allowed us to get some more actual troubleshooting and technical help done. With a little patience (after some trial and error, we even managed to backup some photos beforehand ) , the Android 7 upgrade was successfully performed on an FP2 whose owner had had quite a big trouble with her first FP2 at the previous meetup. Of course, both the owner of the „just upgraded“ FP2 as well as those not having upgraded yet also got a thorough enlightenment on how to properly shut down a 12 MP camera FP2 on Android 7. 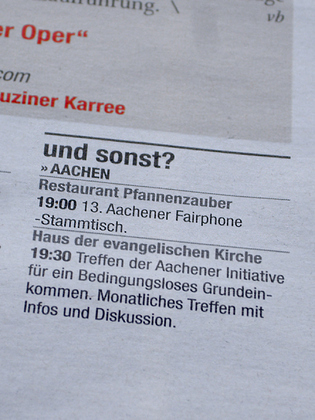 Looking forward to Fairphone Community Aachen’s next meetup in the new year! 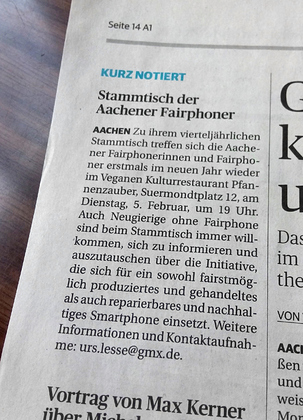 Zugegeben, ich bin mit den schlimmsten Befürchtungen zum gestrigen Stammtisch gekommen und hatte mich nach gerade zwei Zusagen, aber einer ganzen Reihe von Absagen im Vorhinein und noch am Dienstag schon auf ein mageres Fairphoner-Trio eingestellt. So kann man sich irren … Als ich eine halbe Stunde vor geplantem Beginn ankam, waren die beiden Erwarteten schon da … und innerhalb einer Stunde wuchs der Stammtisch auf zehn Fairphoner an. 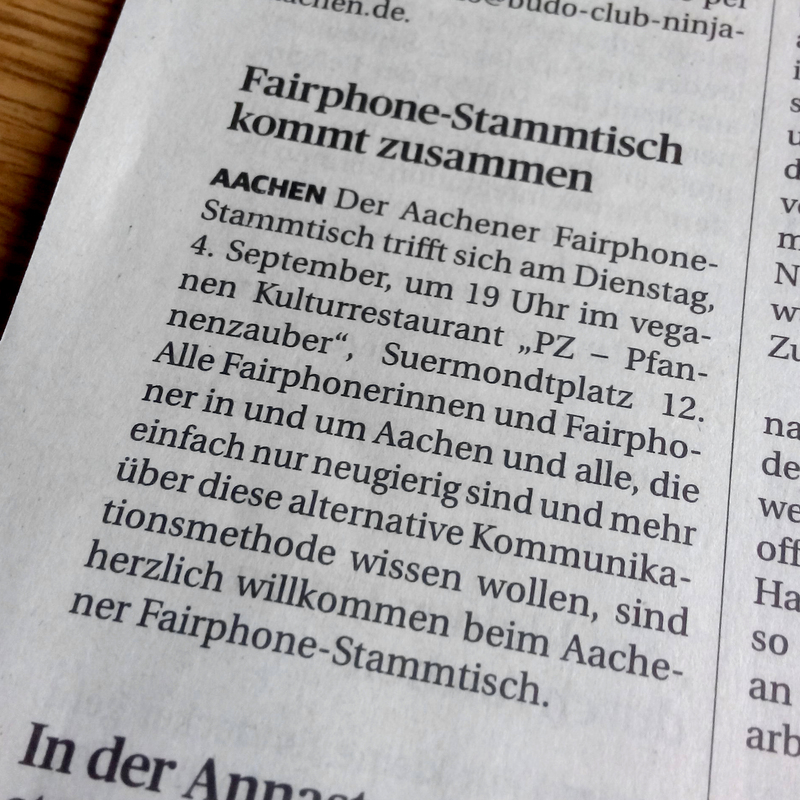 Auch wenn alle bereits mit einem Fairphone ausgestattet waren (8 FP2, 2 FP1), gab’s doch auch drei Stammtischneulinge. 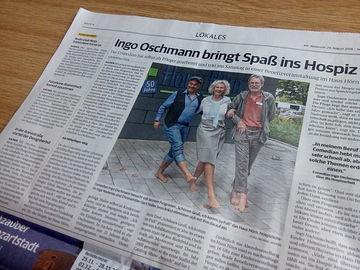 Und zum Glück schafften es auch die Rhein-Ruhr- und Lütticher Fairphone Angels @Amber und @oli.sax wieder, von Rhein & Maas nach Aachen zu kommen. Danke. Die Gesprächsthemen waren alles in allem diesmal ziemlich Fairphone-fokussiert, auch wenn schließlich die jüngsten deutschen Streitthemen (Tempolimit, ja bitte ) zur Sprache kamen – wenn auch mit in dieser Runde wohl kaum anders erwartbar mit recht großem Konsens. Auch wenn für einige der Stammtisch ja bereits geraume Zeit vor dem offiziellen Beginn um 19.00 Uhr gestartet hatte, gab es die letzten Verabschiedungen dann mal wieder erst nach 22.00 Uhr. Entgegen den Befürchtungen des Einladers vor dem Stammtisch, war der Abend also sehr nett. Allerdings, auch zwei nicht ganz so erfreuliche Dinge … der 13. Aachener Stammtisch der erste, der nur aus Männern bestand Und nicht zuletzt war einer unserer nettesten und kenntnisreichsten Fairphoner zum letzten Mal dabei: Der Lütticher Fairphone Angel sagte sein Arrivederci zur Fairphone Community Aachen und der Euregio Maas-Rhein. Er tritt im März seine neue Arbeitsstelle am Mittelmeer an. Félicitations et mille grazie, mon cher ami @oli.sax! P.S. : Dank an @lorahaspels @Monica.Ciovica @Ingo @Stefan für die geduldigen Retweets meiner übereifrig zahlreichen Terminankündigungen! Admittedly, I went to last night’s meetup with the worst fears, preparing myself for a meagre Fairphoner trio after just two confirmations, but quite a couple of cancellations in the run-up to (and on) tuesday. How wrong I was … When I arrived half an hour in advance of the scheduled beginning, the two I had expected were already there … and within an hour the meetup grew to a total of ten Fairphoners. While everyone was already equipped with a Fairphone (8 FP2, 2 FP1), the meetup did include three freshers who attended their first-ever Fairphone meetup. And fortunately, both Rhein-Ruhr and Liège Fairphone Angels @Amber and @oli.sax were able to make the way from the rivers Rhine & Meuse once again, too. Thank you. 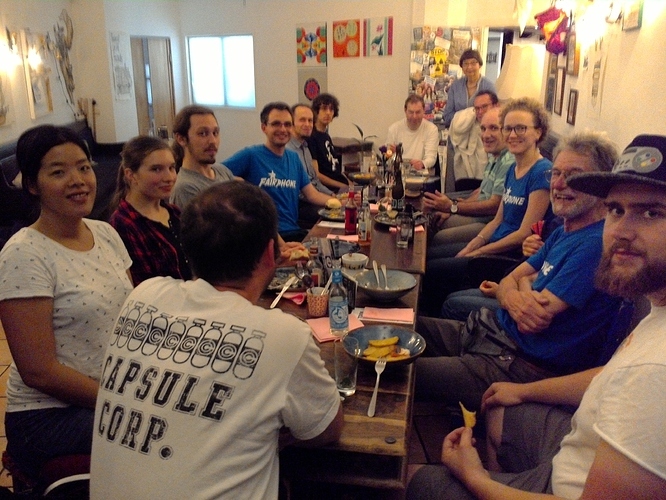 Discussions were quite Fairphone-centered this time, although eventually recent German hot-button issues (Tempolimit hooray ) were brought up as well, although with predictably great unison in this circle of people Although for some the meetup had started well before the scheduled 7 pm beginning, the final goodbyes were once again only said a little after 10 pm. 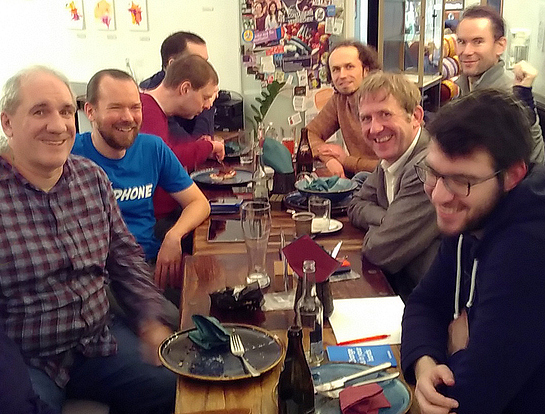 So contrary to the host’s worries in the hours prior to the meetup, the event turned out very nice. However, there were also two regrettable ingredients … Aachen’s 13th meetup was the first ever all-male one And last but not least one of our nicest and most knowledgable Fairphoners joined us for the last time: The Liège Fairphone Angel said Arrivederci to the Fairphone Community Aachen and the Euregio Meuse–Rhine, heading for his new job and life at the Mediterranean Sea starting in March. P.S. : Thanks to @lorahaspels @Monica.Ciovica @Ingo @Stefan for patiently retweeting my overly frequent announcements! Always looking forward to reading your recaps. Please let me know if you ever have particular questions/remarks that come up during the meetups that maybe I can share more info on. 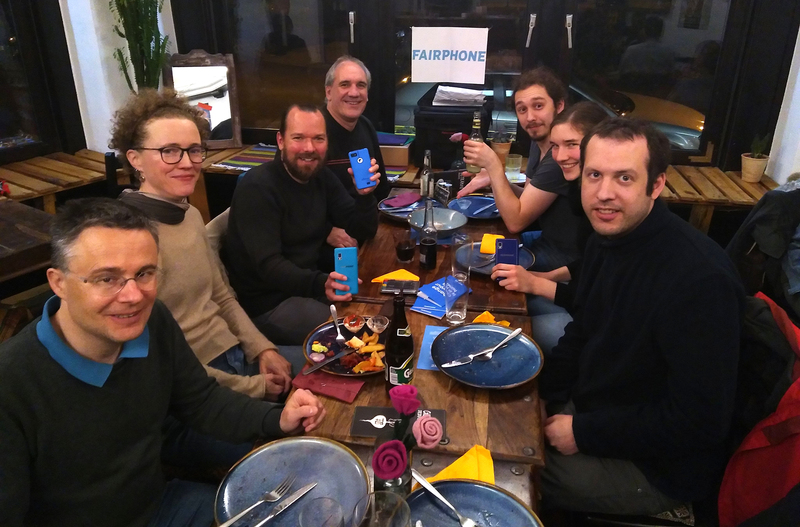 Mit zahlreichen Preisen wie dem Deutschen Umweltpreis ausgezeichnet, ist das Fairphone das am fairsten produzierte und nachhaltigste Smartphone auf dem Markt. Zudem ist es modular aufgebaut und spielend leicht reparierbar. Bei unserem vierteljährlichen Stammtisch gibt es keine Tagesordnung, sondern einfach lockeren Austausch und Kennenlernen für alle in & um Aachen und die Euregio Maas-Rhein, die schon ein Fairphone haben, noch eins wollen oder einfach nur neugierig auf das Fairphone sind. Niemand von uns arbeitet selbst bei Fairphone, wir sind alle ganz normale Fairphoner*innen – die einen mit FP1, die anderen mit FP2 – oder wollen es vielleicht werden oder auch einfach nur mehr erfahren. Wir freuen uns auf Euch! Wer schon weiß, dass sie oder er dabei sein wird, kann das ganz oben mit “Teilnehmen” oder “Going” anzeigen. Und auch für’s Teilen dieser Ankündigung oder auch der Facebook-Veranstaltung wäre ich Euch sehr dankbar! 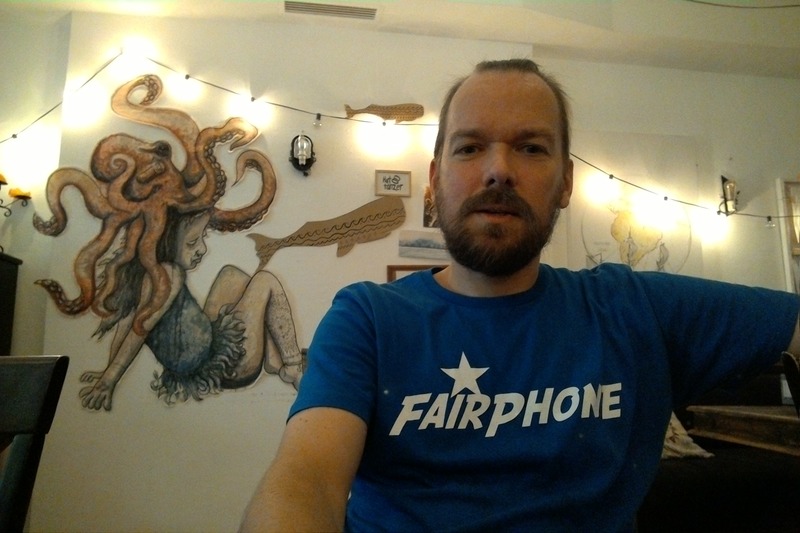 Everybody curious welcome – with or without a Fairphone! If you already know you’ll join us on 4 June, feel free to press “Going” at the very top. Last but not least I will be grateful if you would share either this announcement or the Facebook Event with anyone who might be interested.